A lot of people ask us here at Jackbox Games “What is the hardest part of making a game?” Most of the time, we just ignore that question and the person who asked it and drive away in our diamond-studded limousine. But this time, it was our limousine driver doing the asking, so we decided to put our minds to it as the diamond-studded locks clunked shut and he gave an ominous laugh. As soon as we tired ourselves out from kicking at the windows and drinking all the Yoo-hoo in the mini-bar, we thought long and hard and the answer to his question came to us: picking the perfect release date! Sure, there’s art, programming and when we feel like it, writing, but you GOTTA nail that tricky release date. That’s why we thought even longer and harder and came up with a winner; October 18, 2016! What a perfect date! It’s right before all the big, party holidays. There’s Halloween, Thanksgiving, Christmas, New Years, the two-year anniversary of Ariana Grande licking that donut, and we want to be there when you celebrate. And celebrate you shall! 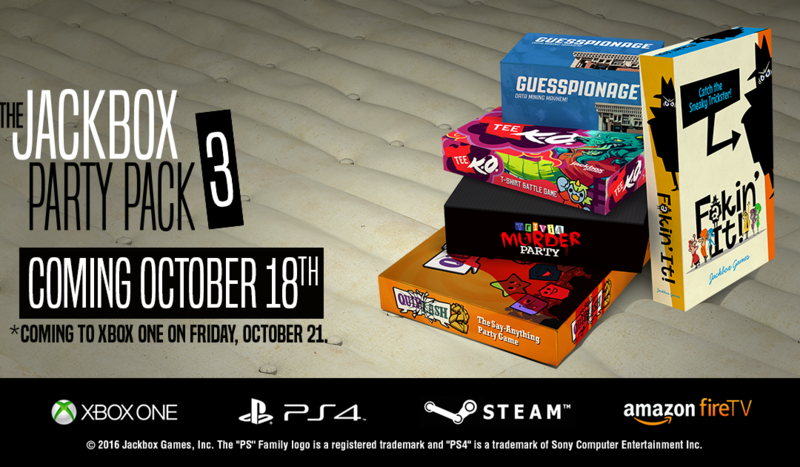 We have some amazing games in this Party Pack that we’ve all fallen in good, clean love with: there’s Trivia Murder Party, a trivia game hosted by a serial killer, Guesspionage, a polling game based on answers from the public, Tee K.O., where you battle your witty T-shirts and slogans, Fakin’ It, where one of your friends is a dirty liar and you have to catch them and finally, Quiplash 2, the sequel to our big, hit game… Uh, I forget what it was called. Wait, I have it tattooed on my hip. Tweety Bird! Nope, wrong hip. Quiplash! That’s it! But that’s not all. We’ve added new features that let you deal with those jerks we call trolls. Our new censor features let you boot those guys the second they get all obnoxious. And believe me, they WILL get obnoxious. Now, who knows how to break out of a limousine doing 80mph down the Dan Ryan, driven by a cackling maniac? Or at least, can someone bring us more Yoo-hoo?